Some of you may know, and some of you may not, but Dave and I live in a one bedroom apartment...and that is being generous. It should really be classified as a studio. Because of that, we have had to be much more creative with our storage solutions. And I am up to that challenge! A LONG while ago, I posted about this weird space between the doorway to our bedroom and the heater unit. A temporary fix at the time was to make a little message board out of wine corks. It was cute but a little small to be functional, and wasn't really adhered to the wall well. So it came down pretty quickly. We always need more storage in this space, and now that we have been here for two years, we have more things than ever. I thought this little space had some potential if I could find the right solution. I picked up these wooden milk crates at Walmart hoping that they could help store some of Dave's records. I think they were like $12 each. When the records didn't fit, I had them stacked so that I could take them back, and they quickly began to hold things. And voila! a side table was born. This may have been one of the easiest storage solutions ever. Who am I kidding, it was a complete accident. It stores old magazines, extra Keurig Pods, a couple of books that don't fit on the shelf below our coffee table, and our extremely small DVD collection. Also some nice smelling candles, some photos and a canvas that my amazing friend Meghan made me. 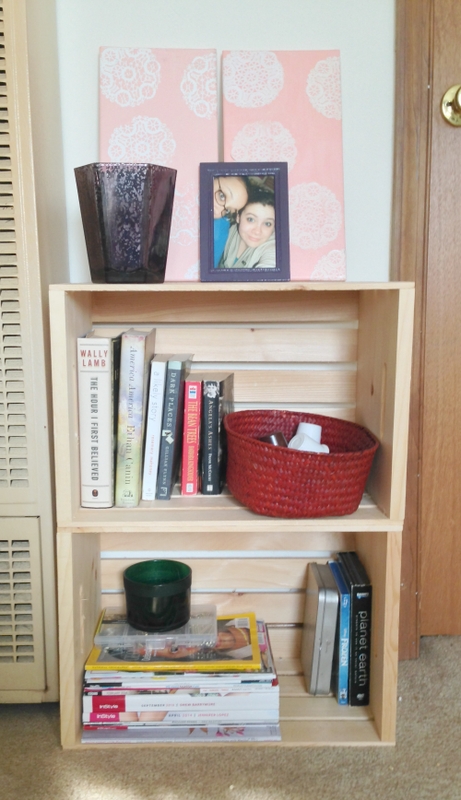 Be on the look out for more small space storage solutions! I have many more to share in the coming weeks! Great tips:) Always good to get some ideas for small space storage. Oh, how I love a wooden crate. I have been keeping my eye out for some vintage ones. Love how you styled them. I found something recently on pinterest where it tells how to style a shelf. There really is an art to it. Love what you did. Glad I found you on SITS today. It's nice to meet you! These are great!! What a great idea! I would love it if you linked this up to my Motivate Me Monday linky party at IT'S A ginger SNAP. I just linked up :) thanks for the invite! Thanks! I'll be sure to link up! This is a great tip, Alex! I love the look of wooden crates...I would love to do this and stain them a blue or green color! Thanks Kristi! I might get that far eventually. This is kind of a temporary fix, but if it becomes more permanent then I might stain or paint. Thanks for visiting! I'll definitely try to link up again this week! You have a nice linky going!